According to the esophagus definition biology, it is a muscular tube that constitutes an important part of the digestive system. The word “oesophagus” owes its origin to two similar Latin and Greek words, and literally means, "entrance for eating". Other common names for this organ of the body include “food pipe” and “gullet”. Now you must be in a position to provide precise answer to the question “What is esophagus definition?” The knowledge of both the esophagus definition and function is valuable for maintaining its health. In this way, you will be able to avoid any problems or disorders of this body organ. So, what do you know about esophagus function? Running from pharynx to the stomach, the main esophagus function is to transfer the bolus (a moist, round and partly digested food mass) from mouth to the stomach. You can call it the upper most part of the alimentary canal. However, it is not just the food that the wind pipe is to take from one part of the alimentary canal to the other. Additionally, the gullet also carries liquids and the salivary secretions. Running from sixth to tenth thoracic vertebrae, its usual length measures to be 25 cm. But, depending on the height of an individual, it shows extreme variations that range from 10 to 50 cm! The food pipe lies behind the wind pipe and in front of the spine or vertebral column. Meanwhile, before entering into stomach, it has to pass through diaphragm. Along this tubular structure, there are three oesophageal constrictions, and a junction at stomach. 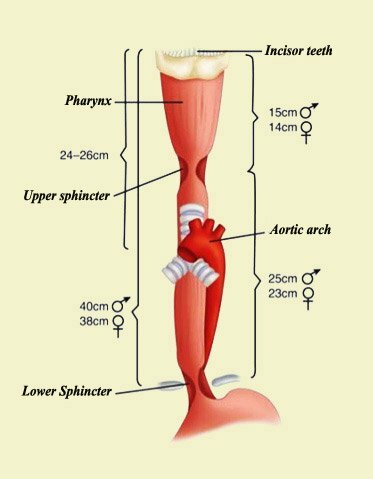 The gastroesophageal junction or cardiac sphincter is the proper name for that particular junction at stomach. As you would have noticed in the esophagus definition, the primary esophagus function is the smooth and one-way transfer of food that is coming from oral cavity. After passing through the food pipe, the bolus goes towards the stomach for further digestion. As the internal wall has a layer of mucosa, the food passes smoothly through it. Consequently, you do not feel any discomfort in the region. The second important contribution of the gullet is to prevent the strongly acidic contents of stomach back into to upper part of the digestive canal. Thereby, you can save your delicate parts from acid burns. What are acid burns by the way? As the very name suggests, it is a burning sensation in the chest region that occurs due to the backward flow of acid from the stomach to the food pipe. Another common name for this type of esophagus problems is the heartburn. One of the most commonly occurring diseases of wind pipe, it inflicts every tenth American at least once a week. Its characteristics feature is the the reflux of acidic contents of stomach into esophageal region. This reflux of acid occurs due to the malfunctioning of Lower Esophageal Sphincter (LES). It involves the symptoms of severe sensation of burning near your heart, coarseness, coughing or no symptoms at all. Now, in addition to esophagus definition, you have also learnt about the heartburn. The gastroesophageal reflux disease or GERD is one of the frequent cases of heartburn with gradually developing severity. GERD affects the ring of muscles between the stomach and esophagus, i.e. the lower esophageal sphincter. This condition makes the victims suffer from acid indigestion and the heartburn. Talking about the remedy, the doctors can treat most of the cases of GERD simply be recommending changes in diet and the lifestyles. However, if the situation aggravates, the patients need to go for proper medication or even surgery. It is the most common structural abnormality caused by iron-deficiency. The condition has also got various other names, including sideropenic dysphagia and Paterson Brown Kelley Syndrome. It is one of the very rare esophageal diseases. As its characteristic symptoms, the sufferers face difficulty in swallowing. However, they may also complain of a burning sensation and esophagus pain. As the disease occurs due to iron deficiency, doctors usually recommend the intake of iron supplements. In other words, correcting the iron-deficiency anemia can also serve as an indirect cure to this disorder. By taking iron supplements in diet, the patients can get rid of esophagus pain as well as improve dysphagia. In case of complications, dilators are used to ease in swallowing of food. As it is decipherable from the name, esophageal web is the formation of a web like structure across the lumen of esophagus, particularly, its upper part. The projection of a thin mucosal membrane into the lumen causes constriction in the esophagus. Concerning diagnosis and treatment, the condition of esophageal webs usually goes unnoticed. However, if the situation aggravates, the suffers will face dysphagia or difficulty in swallowing food. Meanwhile, there may also occur the regurgitation of food. When there is the formation of a web like structure at the upper end of the wind pipe, you call it esophageal web. On the other hand, an esophageal ring is the formation of a ring-shaped tissue at the lower part of food pipe that is usually benign. Nevertheless, the esophageal rings and webs are closely related. The formation of a ring like structure of tissues across the food pipe may result in the partial or complete blockage of its passage. Consequently, the victims experience pain and difficulty while swallowing food. Such a physical defect may be present in an individual from birth. However, injury and tumors may also lead to such a condition. The use of a dilator can help in stretching the ring and widening the pipe for easy passage of food. Another method of widening the ring involves placing a balloon and inflating it. It is the bulging and engorging of veins in gullet that may lead to fatal bleeding. A varix is, actually, a varicose or a swollen vein. So, when the veins in lower third of the gullet experience extreme dilation, you name the condition as esophageal varices (plural of varix). They are likely to erupt and cause lots of bleeding. Portal hypertension (increase of blood pressure in the portal veins) and serious liver diseases are among the common causes of esophageal varices. Actually, there occurs blockage in the vessels carrying a large quantity of blood to the liver. So the blood starts flowing into the small blood vessels which are unable to carry such large amounts of blood. As a result, they rupture and cause lots of bleeding that may also prove to be life-threatening. To stop the bleeding, your health care provider may recommend the use of drugs and other medical procedures. Meanwhile, the elastic bands can prove to be useful to tie off the bleeding veins. An uncommon but a serious condition, esophagus cancer occurs due to a number of factors including chronic acid reflux, excessive drinking and smoking. Excessive body weight can also serve as one of the causative factors. The disease is, however, more common in men than in women. 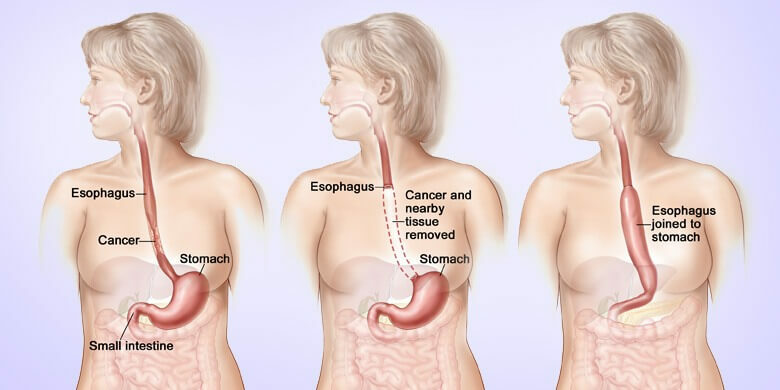 You can diagnose the condition through the esophagus cancer symptoms which include pain in the chest region, trouble in swallowing, weight loss, vomiting, chronic cough and hoarseness, etc. The weight loss occurs because the patients are unable to eat enough food to maintain their bodyweight. A number of treatment options are available for dealing with esophagus cancer. The choice of a particular method usually depends on the severity and stage of the malignancy. The common curative measures include surgery, chemotherapy, targeted therapy, radiation therapy and so on. Mallory-Weiss Tear – It is characterized by a tearing in the lining of food pipe that leads to vomiting blood. Esophagitis – The inflammatory condition of esophagitis occurs due to acidic irritation or esophageal infection. Barrett's Esophagus – Barrett’s esophagus is an irritation and change in structure of its lower part that may lead to cancer. 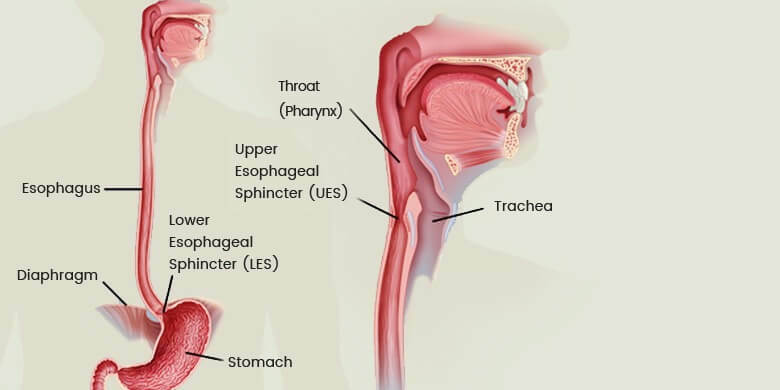 Esophagus Ulcer – Caused by chronic reflux, it erodes the internal lining of gullet. Achalasia – Malfunctioning of LES that involves the symptoms of regurgitation of foods and difficulty in swallowing. 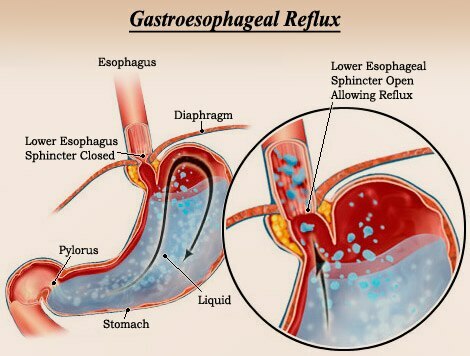 Esophageal Stricture – Caused by chronic acid reflux, it involves the narrowing of the food pipe.